Send your playlist to space with ATV! If you think you can come up with the ideal playlist for astronauts flying around the Earth in the International Space Station , ESA wants to hear from you. Which songs do you play if you want to feel happy? What about if you’re feeling lonely or sad? Everyone has a list of favourite tunes which they listen to when they want to be lively and noisy, or quiet and peaceful. But what if you were suddenly transported 400 km above the Earth, to a collection of cylinders in the sky known as the International Space Station (ISS)? What music would you take with you for entertainment as you floated around the world 16 times a day? 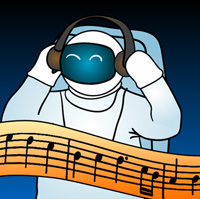 ESA is launching a competition to find a set of 10 tunes that is out of this world. All you have to do is write down a song selection that you think would be most suitable for the astronauts on the ISS to listen to. Before you decide, try to put yourself in the shoes of the men and women who live on the Station and put together a playlist that would cheer them up, inspire them, etc…. The competition is only open to young people under 18 years of age. Entries are only accepted from nationals of the following countries which are participating in the ATV programme: Belgium, Denmark, France, Germany, Italy, Netherlands, Norway, Spain, Sweden, Switzerland. The deadline for entries is 10 May 2007. The winners will be announced in June 2007. Relatives of ESA staff members are not allowed to take part in this competition. The Grand Prize for the overall winner will be a trip to see the ATV launch in Kourou, French Guiana (South America) as well as having their playlist sent to space on board the ATV. One prize for the best entry from each country. Each national winner will win a day trip to the European Astronaut Centre in Germany. Entries can be submitted via the entry form here.